TravStar1 Point Of Sale SystemManager's Work Station House Account ManagementHow Do I Run Customer Statements? How Do I Run Customer Statements? This lesson will teach you how to print billing statements for your House Account customers. From the House Account menu, click on the "Customer Statements" button. 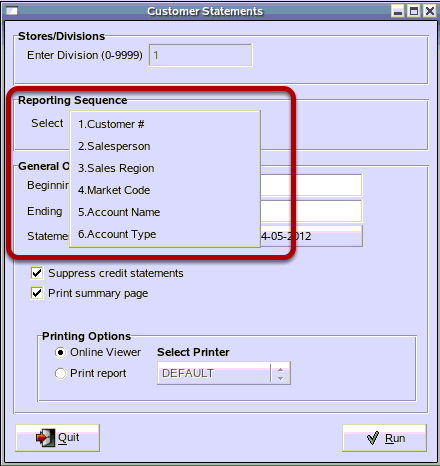 From the Customer Statements screen, click on the reporting sequence drop down menu. Choose either the Customer # or Account Name, unless you have the other fields entered under Customer Setup. If you would like to add this information please see How Do I Edit An Existing House Account? (1) Type in a Beginning Customer # and an Ending Customer #. Note: In this example, Beginning Customer # and the End Customer # have been left blank. This will cause statements to be printed for all customers with the statement cycle that you will choose at a later prompt. 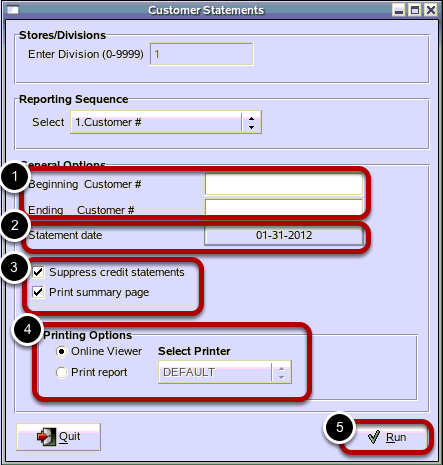 If you wish to print only certain customers, you can enter a beginning and ending customer number. (2) Click on a Statement date. 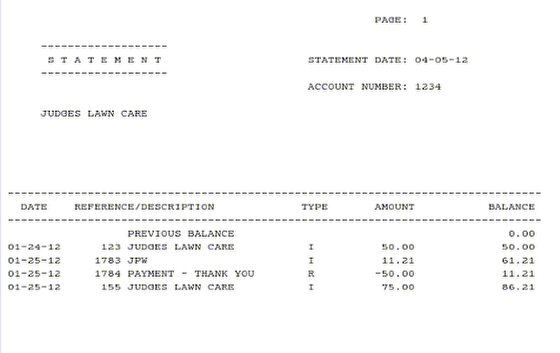 Note: The statement date is the cut off for the charges and payments printed on the statements. This is normally the end of a period (month, weekly, semi-monthly). (3) Suppress credit statements should be checked. If the Print summary page is checked, there will be a total at the end of the statements of the number of accounts and the total of all the accounts billed here. (4) It is a good idea to click on Online Viewer so that you can review the statements before sending them to the printer. (5) Click on the "Run" button. The statement cycle code must correspond with the cycle number in the Customer Setup screen. In this case the default of 0 is used because a statement cycle has not been set up. To find out what cycle number is setup for the customer go to Customer Setup, Status / Misc. See How Do I Edit An Existing House Account? From the Cycle Code screen, click on the "OK" button. This question is normally answered by clicking on the “Yes” button. This will cause the charges to be aged according to the transaction date when compared with the statement date. If you click on the "No" button, then the statements will go by period and the system will age all charges by the month. Here is an example of what a customer statement will look like. Here is an example of the Print summary page option. This summary will show up as the last page of Customer Statements. Prev: How Do I Add a Credit to a House Account? 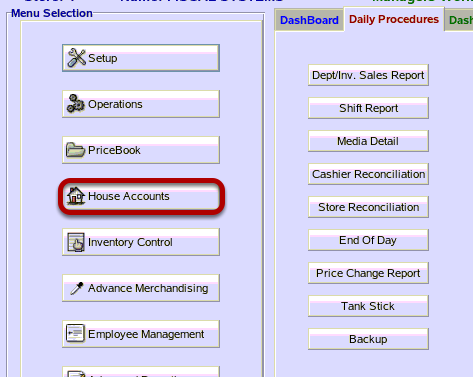 Next: How Do I Send House Accounts (Customers) to the Register?